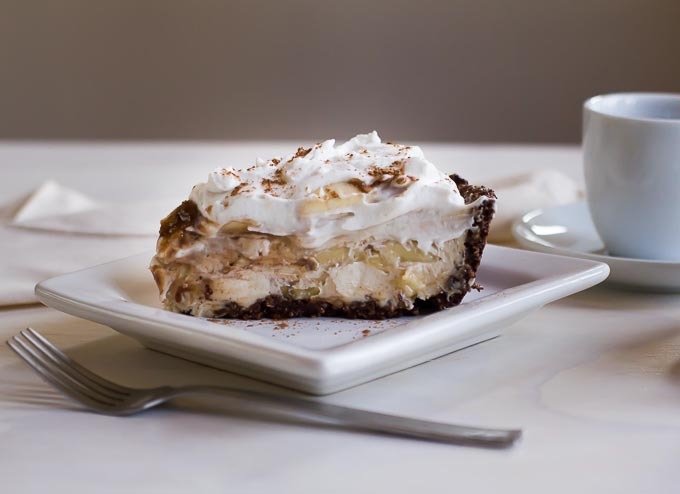 Delicious, creamy vegan banana coconut cream pie makes a great dessert anytime, and with hardly and sugar! It’s almost completely sweetened by the dates and the bananas alone, although you would never know it from the taste. The texture is perfect light and creamy, and no one would ever guess it’s actually healthy, vegan and raw. Also, the whipped cream is super easy to make! It’s great as an accompaniment to fresh fruit and granola, or as a topping for ice cream sundaes. In a food processor, with the "s" blade, process the walnuts and cacao until the nuts are crumbly but not pasty. Add the dates and process a little more until the mixture begins to stick together. Press firmly into the bottom and sides of a 9"spring form pan and set aside. Blend, everything except 4 of the bananas until smooth in the blender. 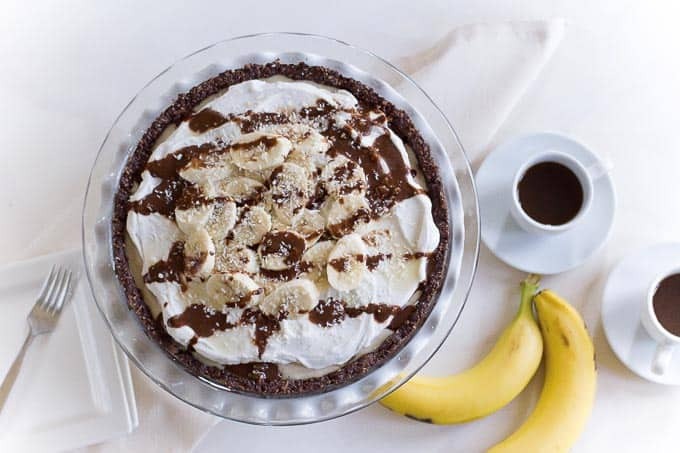 Pour some into the prepared crust over some of the sliced banana. 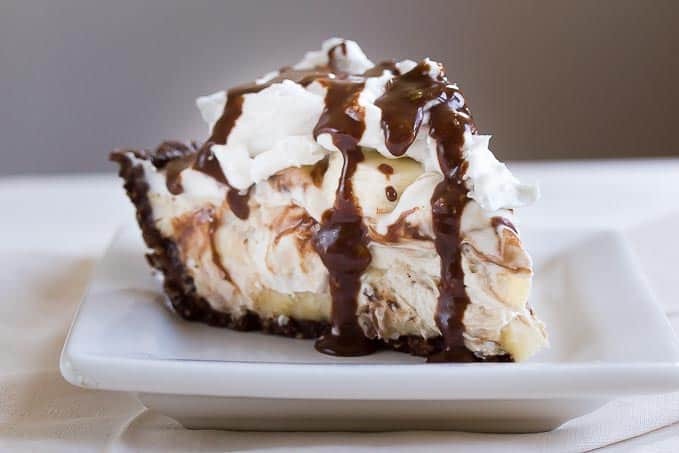 Alternate sliced banana with the filling until the pie crust is filled. Allow to chill overnight until set. To separate the cream from the water in the can of coconut milk, refrigerate it overnight Turn the can upside down and open the bottom. Pour out the water, leaving only the cream. Whip the cream (that has been separated from the water) with the agave until smooth. Allow to set up in the refrigerator until it has the consistency of whipped cream. Spoon on to the top of the pie before serving. The pie was fabulous, but only what we now expect from Chef Rachel Carr! I have eaten a few times at 6Main and never been disappointed! Well, yes I assume that individuals who are choosing to avoid agave will substitute another sweetener. Personally I feel that desserts are not something that should be eaten very often-a “party food,” so to speak. I don’t mind having a little agave once in a while. All sweeteners have issues when you are looking to eat a very clean diet! i love your raw recipe pie ,i like too now if you have a recipe raw books for weding cake my son will marry and he his sugar free if you have one let me now i can by ,tanck and bless you. Had this last week at the restaurant, LOVED it, and wished I could get the recipe. Thanks so much for sharing ! Thank you so much for sharing the recipe for this incredible treat! It was so good we had to go back for more! This is definitely on my to make list. Waiting for my raw cocoa and some other supplies to arrive so I can make the chocolate ganache. I only wish we had a supplier around here but I am finding what I need via mail order. Will jane to look for medjool dates and thai coconut meat next! Love your restaurant! You’ve inspired me to eat and cook healthier. I’m going to make this for Easter dessert this year. Just wanted to check if the cashews are soaked before hand or not? Yes! They are soaked a minimum of two hours, but overnight is better. Also, you will want to rinse them quite well and discard the soak water. Good luck and let me know how it goes! don’t you need to soak the cashews for a little while? Yes! Soak for at least two hours! what is on the top of the cream ? I’m a brazilian nutritionist who loves to cook and teach how to cook in a healthier way! I just loved the recipie, but I had a doubt:for the whipped cream the coconut meat needs to be fresh? WOW! Rachael, you outdone yourself! 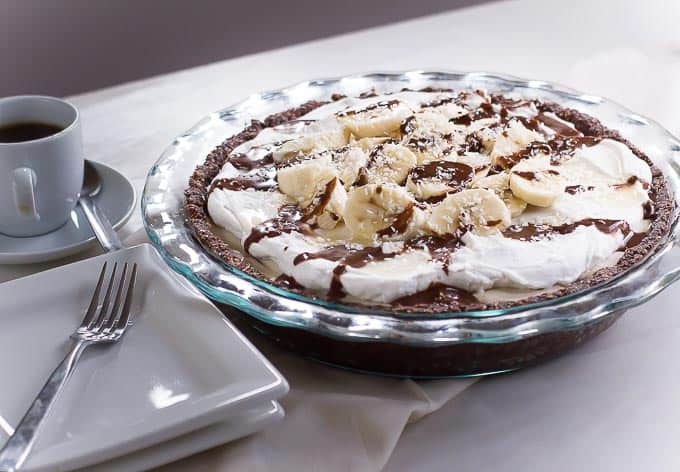 Your recipes not only look delicilus and mouth watering, I am salivating over your vegan banana cream pie……..I am gonna weap that sucker tomorrow. Great going to bad you are not closer but I can’t complaint as there are many fine vegan restaurants close to where I live. Vegan life is AWESOME! since 1995 and no regrets and never ever looking back. There is nothing to go back to but death and suffering. Thanks for the comments and enthusiasm, Alfredo! I hope you enjoy my site and congratulations on your commitment to plant based living for so many years! This pie is going to be so delicious, I’m preety sure! But could you please clarify regarding coconut milk you use for the filling. Would you recommend fat full milk or light milk? Tnank you! Hi! The whipped cream should keep for several days before using it. I’m new to vegan cooking–made this for a vegan friend who’s recovering from a broken leg. Delicious! I followed the recipe as written but hit a few snags. For example, I didn’t know to soak the cashews, having read only the first 9-10 comments/replies before choosing this recipe. But the filling seemed fine. Next, I wasn’t sure whether to use unsweetened shredded coconut. The dates are sweet, so I used plain (unsweetened) coconut. However, it was dry and crispy, not soft and malleable like sweetened coconut I have used. So I added some liquid to make the crust hold together. It worked well, and sooooo yummy I could eat a bowl of it. Due to delivery schedule and chilling times, I did not use my springform pan but used an ordinary disposable aluminum pie pan lightly oiled. Worked well. When served, the slices came out cleanly, beautiful. Used a small serrated knife. While a pie slice is a little less impressive than the tall slice from a springform pan, it was very pretty on the plates–and they loved it! Thanks for the recipe. This is heavenly! Do you have any suggestions as to what I could substitute for the cashews so I could share this with a friend who is allergic? Hi You could substitute Macadamias, I believe. Can this recipe be baked? Also what is the crumbly looking stuff on very top of the cream. This pie was unbelievable. I made it a couple of days ago for my husband’s birthday and we were all completely blown away by the incredible textures and flavors. The crust held its shape and was a fantastic contrast to the creamy filling. I substituted macadamia nuts for 1/2 of the cashews in the filling and it was rich, silky and flavorful. 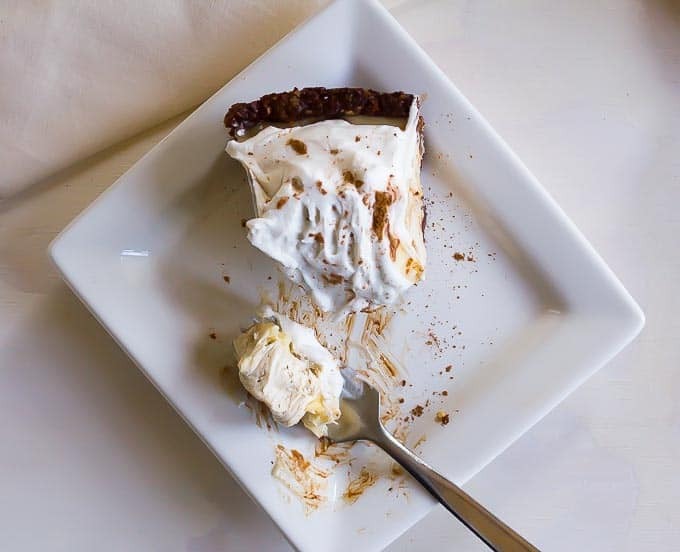 Thank you so much for creating this recipe and posting it…I think it was the best dessert I have ever eaten. Thank you!! I think that was a great idea to substitute macadamia nuts. Did I miss the note on coconut milk for the filling? Also what type of chocolate drizzle did you use? Hi Tina! I updated the recipe so it’s clearer regarding the whip cream! For the chocolate drizzle, I just blended some agave, cacao and a handful of nuts to thicken it, I think hazelnuts or cashews that day. Is there a different recipe for this one? The pictures are different. If so, how may I get the recipe for the pie in the link provided above? Hi Gloria! The only difference between the two recipes is that I added cocoa powder to the crust in this version. Otherwise they are identical. To make the one on the link you are inquiring about just replace the cocoa powder with the same amount of shredded coconut! Hiya, This is a lovely food recipe, thank you for the detailed recipe. I am a good food lover and We like making chocolate cake.